Spotify is the perfect solution for listening to music for free without limits. Spotify is a platform for community-based music distribution in line with Last.fm, Deezer or iTunes. With a simple and clear interface, it offers a music database and a particularly well-rounded radio that lets you discover songs randomly in musical styles (Alternative, Blues, Disco, Pop, Funk, etc function. ) and music periods (50, 60, 70, etc..) of userâ€™s choice. In addition to all the albums of an artist, it will display the best songs , radios and associated with a biography in English. The application provides direct access to the records of artists and albums and fits perfectly Last.fm scrobbling software (transmission tracks listened to the site). In addition, it keeps a history of listened tracks and allows user to share with sending links by e-mail, instant messaging or directly to Facebook or Delicious. Options readings are classics: random and repeat modes, pause, play, volume control, previous, next. Play lists can consist of beings by compiling an album or songs one by one. If there are used multiple computer, they will be automatically synchronized. Encoded in Ogg Vorbis q5 at a rate of 160 kbit / s, the sound quality is honorable. Spotify has in its library of over 13 million tracks. The user can create up to playlists from this collection well stocked. 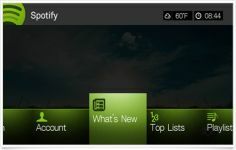 The software supports the drag and drop system. Curently we don't have any log information about Spotify version 1.1.4.197 for PC Windows. We will this change log update soon!